Thanks to American Craft for featuring Robby Cuthbert Design in their latest issue! Last week I took a quick break from making practical things to design and build a little sculpture. 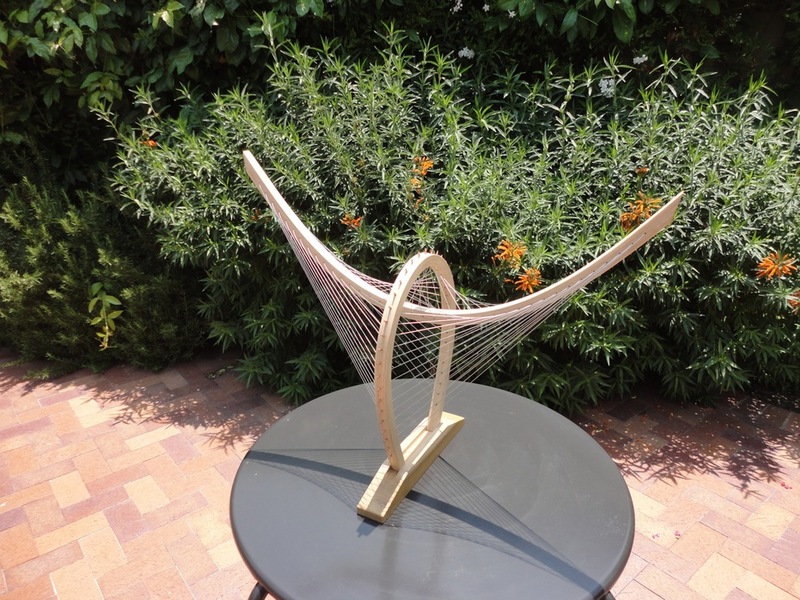 Making abstract sculptures is one of favorite ways to generate new ideas. It allows me the freedom to play around with new forms and concepts without having to worry about possible practical applications. In some instances, a sculpture may give me an idea that I can use later on to make a functional product. Other times, I'll end up with a piece that will never be anything more than an abstract sculpture. Both outcomes are fine by me, since it's the process of creating a sculpture that I find really rewarding. Cradled Ring, is a bit of a departure from my previous sculptures. 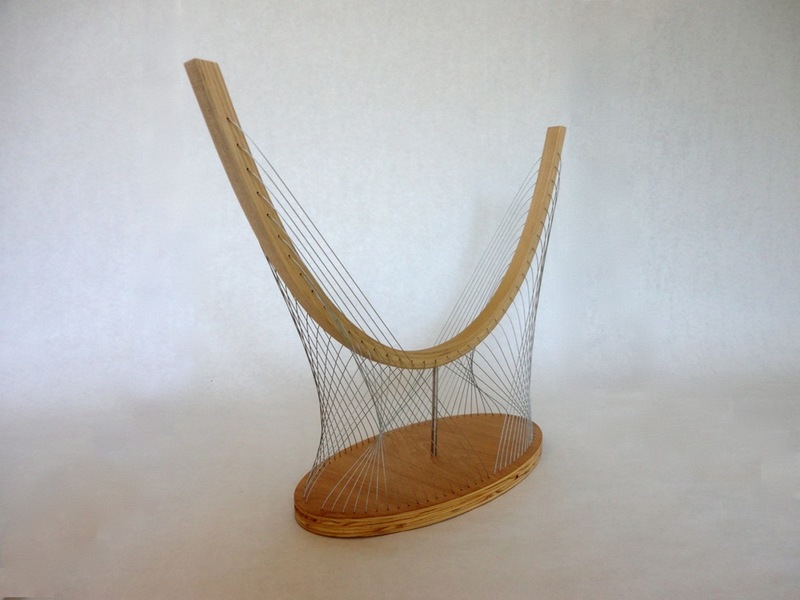 Though I still utilize steel cables under tension as the source of the sculpture's stability, I challenged myself with the design of this piece to use as few cables as possible. The Brazilian Cherry ring hovers just above the two cherry arms, with both ring and arms being supported by a total of four small steel cables. 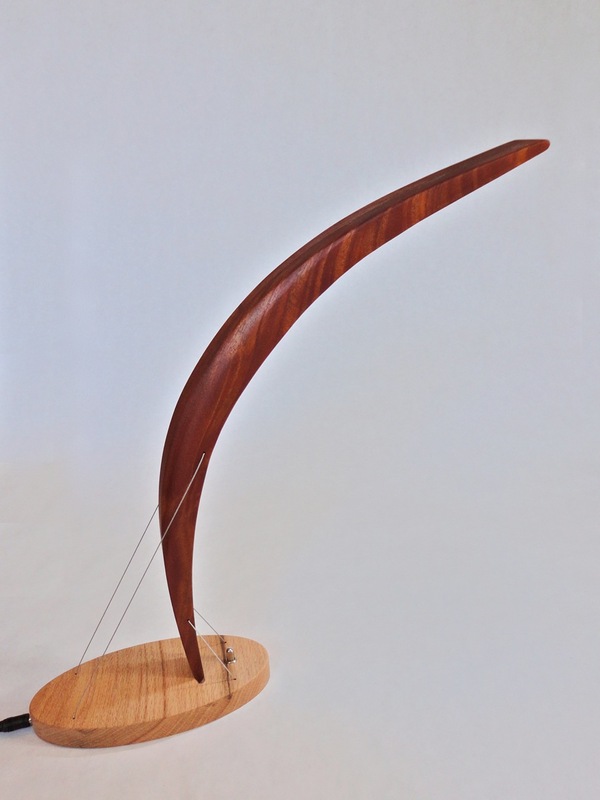 Forgoing the intricate cabled contours characteristic of my other sculptures, this piece focuses much more on the interplay between simple forms and on the beauty of natural wood. The sculpture's ring is removable, allowing me the ability to play around with different shapes and interactions in the future. The final result! It's different from my other work, but one of my favorite sculpture I've ever made. 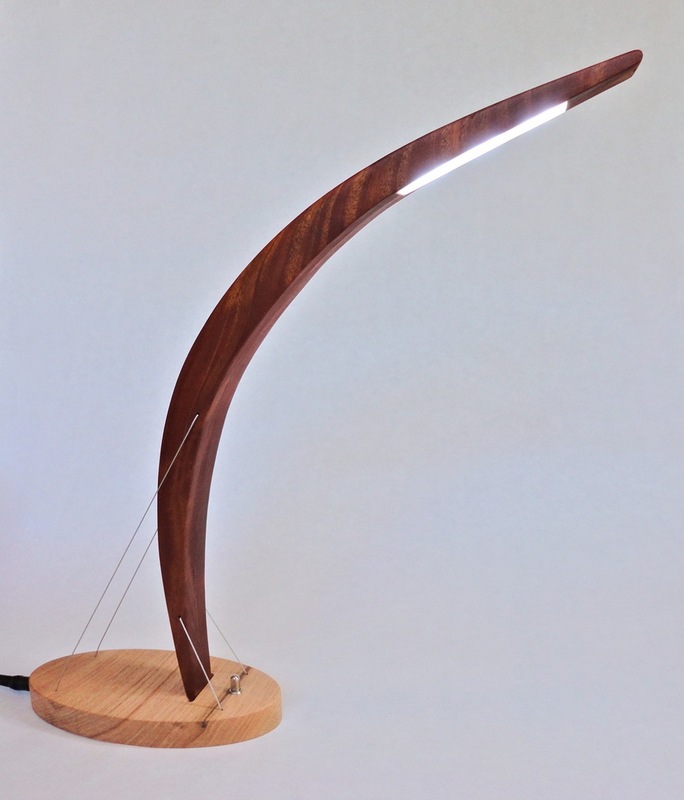 It’s time for a post about the second of my new products: The Arc Floor Lamp. Unlike the Balance End Table, I didn’t have to start from scratch with this design. Instead, I drew upon my preexisting Peering Lamp and Signature Lamp designs and scaled them up to create a 5 ft tall floor lamp. The Signature Lamp, which stands only 12" high. The Peering Lamp at 16" tall. Figuring out proportions in my sketchbook. The two most challenging aspects of scaling up the Signature and Peering lamp designs were deciding on proportions and figuring out how to cut the wood for the central mahogany curve. 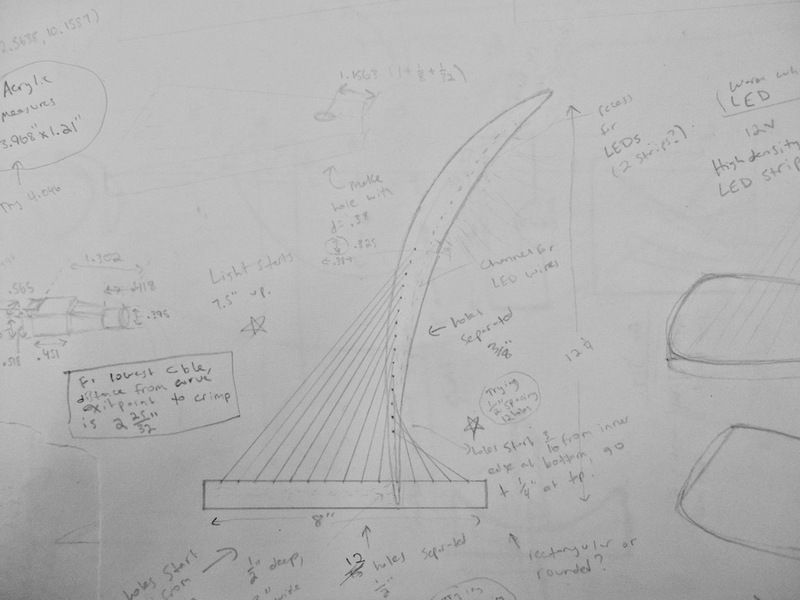 Working out the proportions was difficult because if I simply scaled up the desk lamp designs I would end up with a base that was almost four feet long. It would be problematic to have such a bulky base, but at the same time I had to make sure that the base would be large enough to support the mahogany curve. In order to solve this problem I turned, as usual, to my sketchbook. I quickly learned that the Peering Lamp’s curve was too extreme and, if I used its design for the floor lamp it would just topple over. On the other hand, I wanted a curve that could reach over a couch and serve as a reading light and the Signature Lamp’s curve was a little too gentle to accomplish that. As a result, I ended up working out a new design that split the difference between the two desk lamps’ curves. 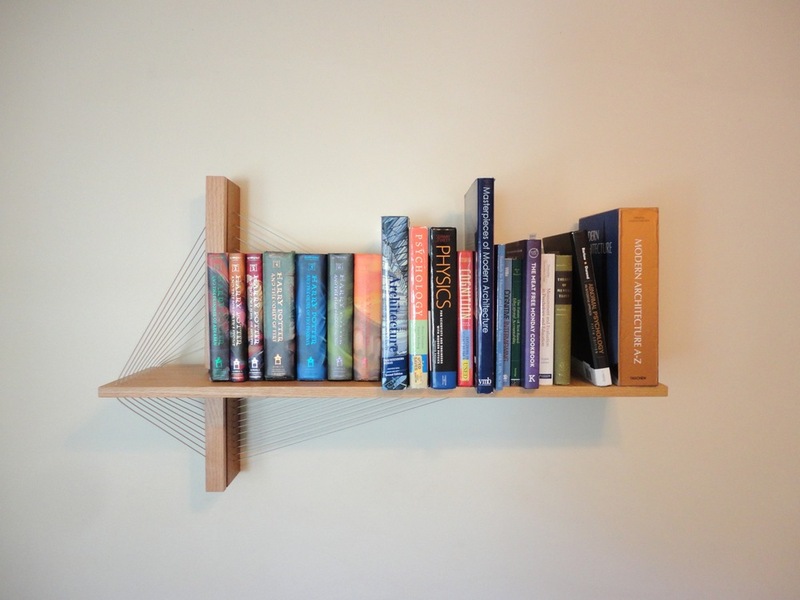 The curve was not so extreme as to topple over on its proportionally smaller base, but it had enough reach to curve gently over a couch and serve as a perfect reading light. Planning out the placement of the four curves and mahogany boards in the CNC program VCarve, I was able to determine the most economical use of wood I was using. Once I had decided on the design of the curve, I had to figure out how to cut it out. Adding to the challenge was the fact that I had to fit some sort of light bulb inside the curve. I had already decided not to use the same tiny LEDs as the desk lamps, since I felt that a floor lamp would require a more powerful bulb. I eventually decided on a 13-Watt 2-pin CFL bulb that, though compact, still required much more space than the LEDs used in the desk lamps. Doing the calculations, I figured that the top of the lamp would have to be at least 3 inches wide to accommodate the bulb. This meant I would need four layers of mahogany wood to build up the curve, as opposed to the two needed for the desk lamps. This added to the challenge of cutting out the curve since it essentially meant that I would have to cut out four separate curves that would later all be glued together. 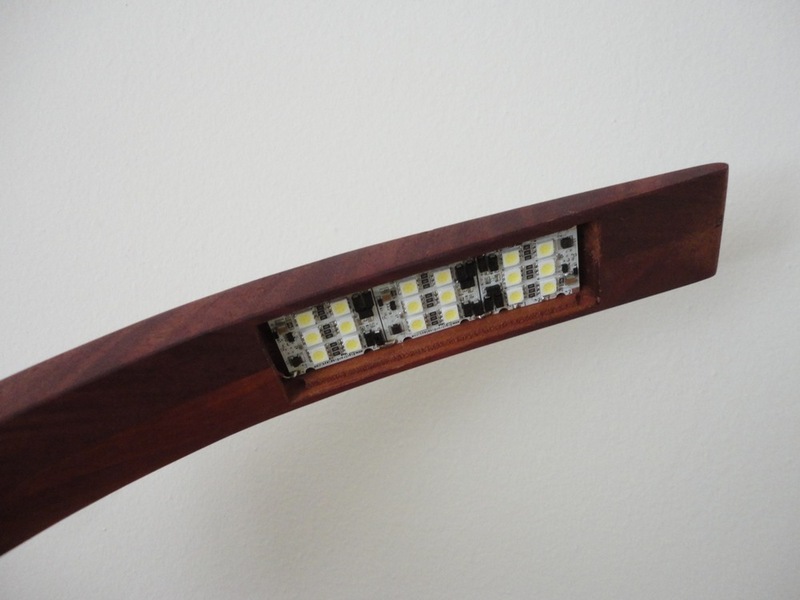 Cutting the curves was never a problem with the desk lamps, since they fit easily on one piece of wood. In this case, however, there was no way even one curve could be cut out the largest piece of mahogany available, let along four. After lots of thinking, I decided that the best approach would be to lay a bunch of mahogany boards adjacent to each other on the CNC machine bed and cut all four curves out at the same time from those boards. This would result in about 20 pieces that, if glued together in the right way, could be used to make the lamp. It’s a little hard to explain clearly, so just take a look at the pictures! Having visualized the placement of the mahogany in VCarve, I was able to precisely place the boards on the Shopbot. The two ovals that make up the lamp base. Gluing the many mahogany pieces together to make the final curve. After cutting out the pieces and gluing them together, I sanded the curve like crazy to give it a more organic form. Once I had it smoothed and coated with a thin layer of polyurethane, it wasn’t too difficult to add my usual steel cables that hold the curve carefully balanced atop the base. The end result is a piece that suggests imminent movement. The curve, though rooted firmly to the base, looks like it could lift off at any second. I’m really happy with the end result! The lamp in my booth at the Architectural Digest Home Design Show. Over the past six months I have made a LOT of lamps, shelves and tables... More than I ever imagined I would! With so much being produced, it's inevitable that every once in a while a product ends up with a minor defect that keeps me from sending it out to a customer. Most of these defects, however, are very small and probably nobody but myself would notice them. Rather than throwing them away, I have decided to offer these products at a big discount on the new Specials page. 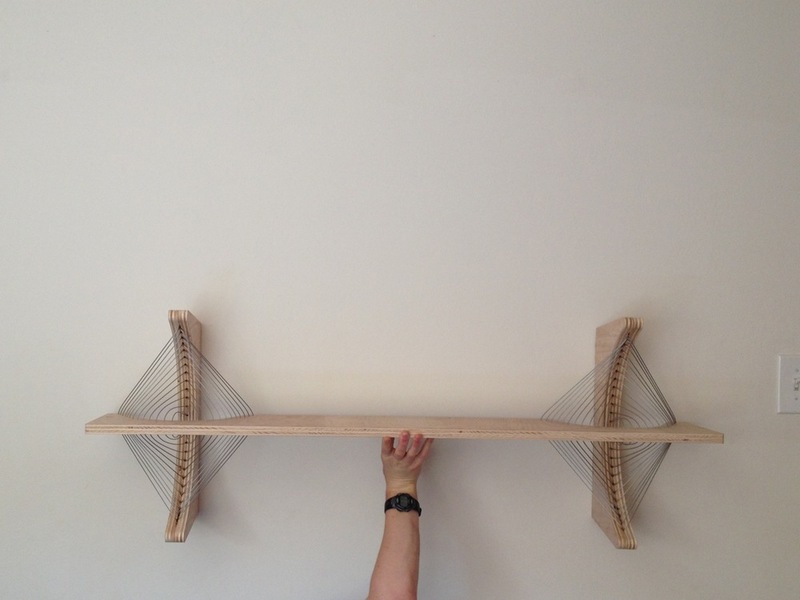 To start, I'm featuring a Suspension Shelf and a Peering Lamp! Over the past couple of months I designed two new products that I finally got to show to the public a couple of weeks ago at the Architectural Digest Home Design Show. I didn’t want to post too much about them before the show, but now that it’s over I’m excited to share the stories behind each design. The first of the two new products is the Balance End Table. I began work on it in early January and, as always, I started with plenty of abstract sketching as a way of brainstorming possible designs. Apart from planning to use steel cables under tension as a key structural element, I had no idea what the thing would actually look like in the end. I hadn’t designed anything new in a while, so I wanted to take this opportunity to really play around and come up with a new cabling pattern that I had never used before. It’s always a little tricky to figure out new ways to incorporate cables into my work because, along with looking good, I require that they serve a structural purpose. I tried out a bunch of different ideas on paper, many of which revolved around the idea of using steel cables to balance a tabletop on some sort of “leg.” In my mind all of these designs looked great, but once I sketched them out most ended up being impossible designs that couldn’t actually be engineered. 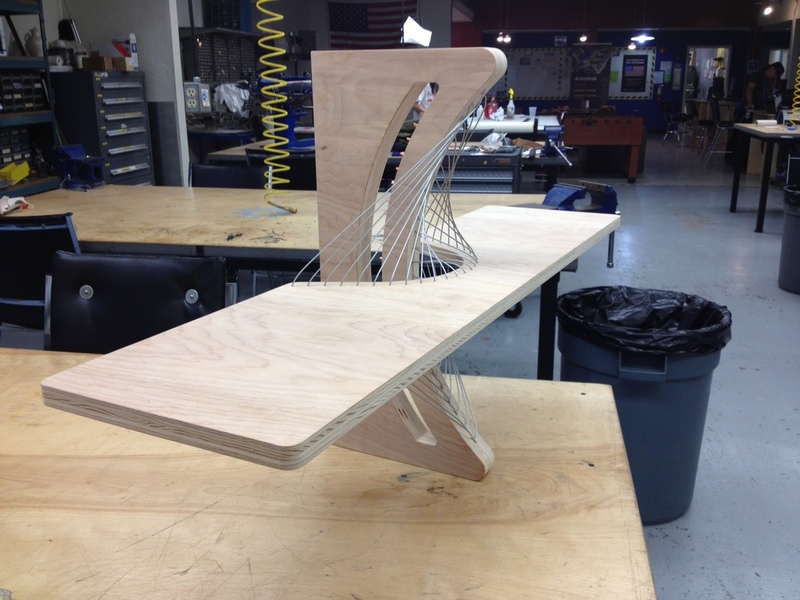 An early idea involved the tabletop being precariously balanced atop one leg, but it proved too tricky to engineer. I eventually came up with two central ideas that served as the foundation for the rest of the design. First, I realized that if the table was going to feature some sort of tabletop held in balance by steel cables, the tabletop couldn’t just be a simple piece of glass like in my coffee table designs. Instead, there needed to be some part of the tabletop that the cables could run through and pull on. This bummed me out a little, since I’ve always felt that a clear glass top works best with my sculptural table bases. Looking for a way around the problem, I came up with the idea building a tabletop consisting of a wooden frame with a glass inset. I figured that this way the cables could run though and pull on the frame, while the glass inset would keep the base from being too obscured. The second central idea I arrived at was the notion of balancing the table on two legs in opposite corners. Up to this point, I had been trying to balance the table on different various shapes and it just didn’t work. The idea of using two legs was very simple but, as I’ve learned, simple ideas can often take a while to arrive at. Having decided upon using a two-legged design with a framed glass tabletop, I was finally able to sketch out some tables that could actually be built. The only main problem left was to figure out how I would orient the cables so that they would both look cool and stabilize the tabletop on the two legs. In the end, I decided upon a design that had the cables running up from a square base and into one side of the wooden tabletop frame. From there, the cables would run horizontally to the other side of the frame just under the glass and then back down to their origin points in the base. 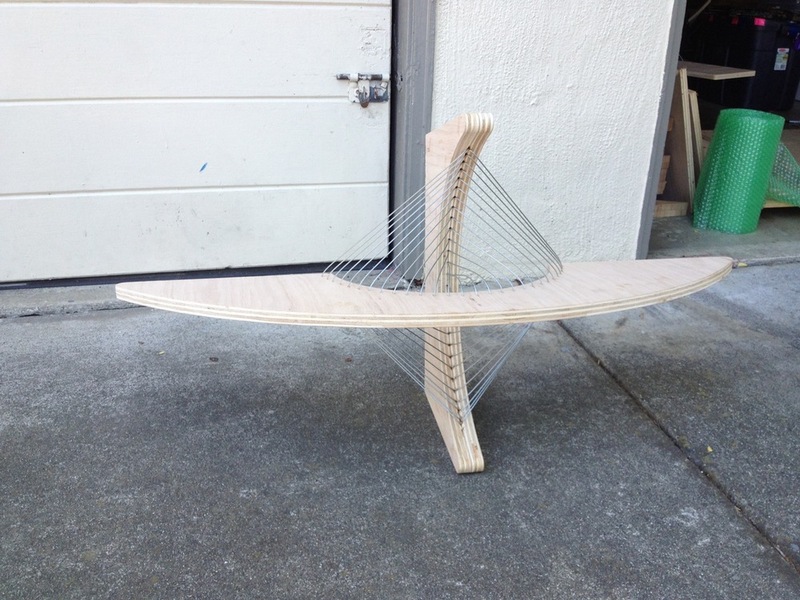 With this design, the cables would not only create interesting contours, but they would also pull downward on the tabletop, holding it firmly balanced atop the two legs without any need for glue or screws between the two. After completing my drawings, I built a plywood prototype to make sure the cables would both look good and actually hold everything in place. The prototype worked great, so I moved onto building the final product. Going with the idea of trying new things with this design, I decided on trying out some new woods I had never worked with before. I knew I wanted a contrast of light and dark woods and I ended up going with cherry for the legs and sapele for the base and frame. Unlike most of my other designs, this one required very little use of the CNC machine. 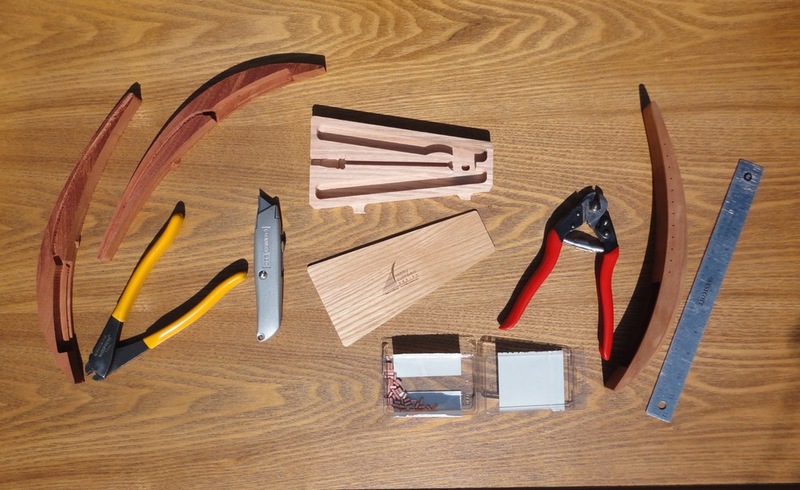 Instead, all of the parts are shaped and assembled completely by hand with the use of saws and sanders. 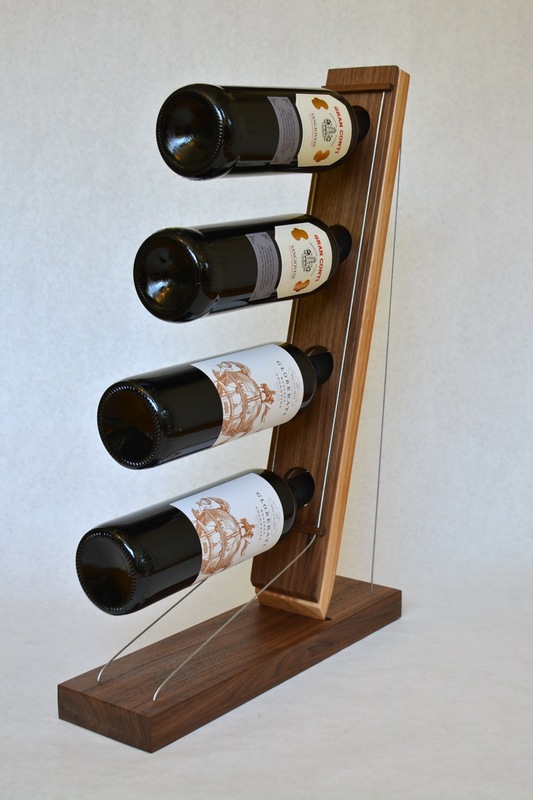 As a result, this is my most time-consuming design to manufacture, but I think it’s worth it given the result! The table base is made of many pieces of sapele wood. Here they are being glued together. The table base and frame, having received a coat of polyurethane, are ready to be cabled up! After finishing the design and having a while to think about it, I’ve decided that my favorite thing about it is the way the contours created by the crossing cables seem to transform as you walk around the table. Take a look at the pictures below that show the table from different angles and you’ll get a sense of what I’m talking about! 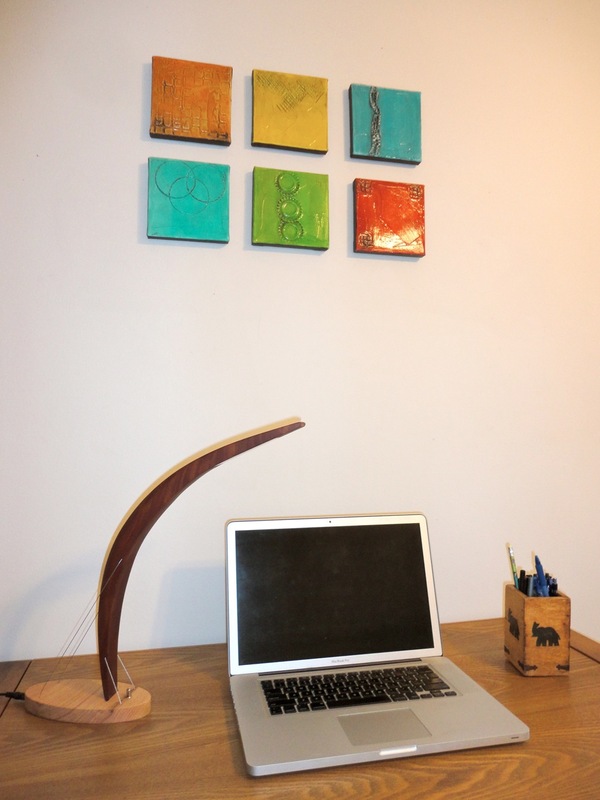 Check back soon for a post on my other new product – the Arc Floor Lamp. Thanks to Sunset Magazine for featuring my Suspension Shelf in their February issue! Hey there! I just wanted to give a quick shout out and thanks to everyone on Reddit. I posted an album of my work there this morning and it got way more attention than I ever would have expected. I had 93 site views yesterday and today I'm pushing 37,000! What!? So thanks to everyone who has stopped by to check out the site, I really appreciate all the positive feedback! Welcome to my new website and blog! A lot has changed from my previous site, so take a look around! Right here is where I'll be posting all future updates about projects and ideas. I've brought everything over from my old blog and will be adding to it a bunch in the next couple days with posts about all the new designs I've recently completed work on. Stay tuned!